The Dark Souls games have some grueling and difficult boss fights, but that doesn’t stop committed players from adding self-imposed modifiers that make the game even more difficult. And nothing says “difficult” more than a fists-only boss fight at level one. Yhorm the Giant is one of the lords that a Dark Souls III character needs to defeat in order to progress the story and beat the game. His fight is wonderfully designed and takes place in a lush, detritus-filled arena. It’s also a fight that’s meant to be “solved” in a very particular way. 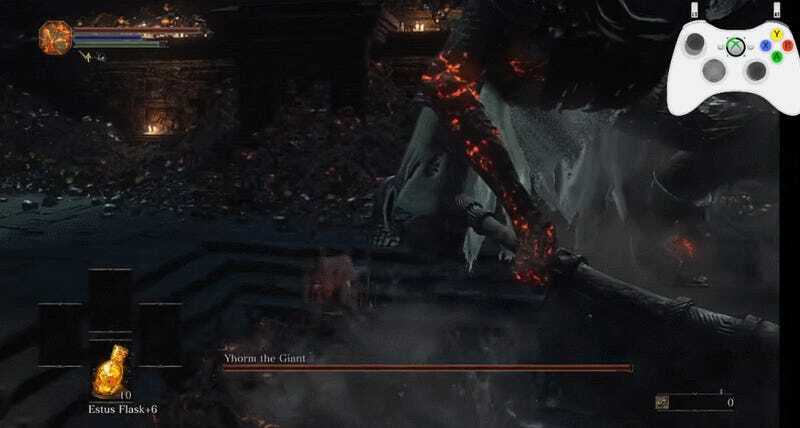 You see, Yhorm is a giant, and there’s a sword in his throne room that’s built just for killing giants. You’re supposed to pick it up and shoot magic laser beams (or whatever) out of it and at the giant until he dies. A YouTube user named EIM64 has gone the extra step. They have defeated Yhorm without the sword. Better yet, they did it with their fists. And, to add an additional layer to the top of the difficulty heap, they did it at Soul Level 1. You know the level in World of Warcraft where a tiny woodland beast is a ravenous creature that can destroy you? They defeated a mid-game boss at that level with no weapon. It took an hour and a half. What I find so fascinating about Soul Level 1 using only fists is that they are trials of endurance as much as they are actual skillful challenges. The striking thing about EIM64’s video is how much discipline is involved in getting close to Yhorm, hitting him, provoking a certain set of attacks, and then backing off for a reset. The controller map in the upper right of the screen makes it even better, showing you exactly what the player is up to at any given moment. To be clear, this isn’t a unique accomplishment in the world of Dark Souls III players. Soul Level 1 and fists-only runs are a form of ultimate challenge when you’ve run up against the limit of doing anything else in a Dark Souls game. 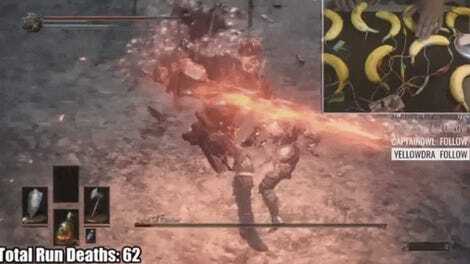 Here’s someone fighting the notoriously difficult Nameless King boss the same way. It’s an extraordinary display of patience that I could never summon up in a million years, and it’s a display of economic action that my flailing and rolling Dark Souls play style just cannot manage. EIM64, I salute you.